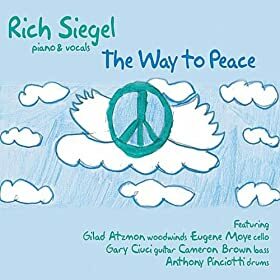 The Way to Peace is Rich Siegel’s brilliant debut album. Rich is a NYC pianist, singer and song writer. But Rich is also a dedicated Palestinian solidarity activist who devotes most of his time and energy to the Palestinian cause. Rich was brought up as a Zionist but in the last decade he has been reawakening to the Palestinian plight. Like a few other Israeli and Jewish artists, he decided to transform guilt into responsibility. The album features Rich’s warm voice and brilliant piano playing. It also features Eugene Moye, Gary Ciuci, Cameron Brown, Anthony Pinciotti and myself on sax and clarinet.